Kaydon Klay is a teenager who wants, more than anything, to be famous. Now she has her chance--in the wake of a national tragedy in Hollywood. She was the friend of, and babysitter for the son of, the woman who has murdered dozens of Hollywood stars in a spectacular and horrific event. An agent quickly latches on to her, most of her classmates turn on her, and as scary as her first media event is, she is hooked. There's a thrill of power and a promise of wealth. There's also her mother, who is alarmed by the turn of events, desperately worried for her daughter, and determined to maintain her own high moral and ethical standards. The money that Kaydon thinks will please her hardworking, financially struggling mother is the final straw, the proof that Kaydon is being drawn into a lifestyle that will destroy her. 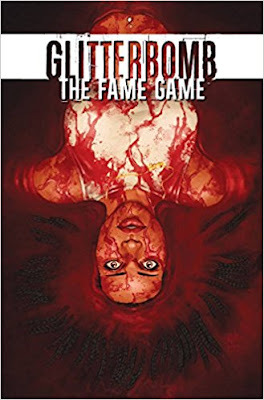 In the midst of all this, Kaydon finds herself targeted by a strange and terrifying woman, who is apparently the real force behind the murders, preaching a terrifying message of pain being the only thing to cling to. Kaydon is just sixteen, and she's surrounded by terrifying and dangerous choices. The art is very good, and to the extent that I don't like it, it's because it's depicting things I wouldn't ordinarily have chosen for entertainment. Kaydon's character is central. She starts out an uncertain, scared teenager, and changes and grows under the pressure of the forces trying to consume her. In the end, I liked it. Character is at the core of what I enjoy in fiction, and Glitterbomb:The Fame Game delivers on that.